So I made the first step towards moving back to Android. I ordered a Moto G5 Plus for my partner (one day before the G5S variants were announced, typically) to replace her two year old Lumia 640XL. I managed to find an online store selling them for £50 less than anywhere else, but I’m not going to tell you the store name as it’s been a few days now and the order is still in “processing” status (so I’m beginning to get a little bit concerned about the site being just a scam). For years I sold family members on Windows Phone/Mobile as I still genuinely believe that for non tech savy people it’s the simplest mobile OS out there. But Hayley was increasingly asking about apps that didn’t exist on the platform. These same apps are not going to magically appear even if the C-Shell variant of Windows ever appears either. And what with Microsoft yet again seemingly abandoning the platform, using an alternative is now regrettably a no-brainer. So now I find myself going into the Google play store and seeing what’s new, checking what I already have in my library, and what I can spend my money on. The loss of my beloved OS will be a bitter pill to swallow initially, and I mourn the loss of the one app running everywhere future, but I’m actually starting to look forward to the change in some ways. Right now I wonder if I’ll ever find a reason to go back to a Mobile Microsoft solution. Perhaps if they really do have something magical up their sleeve. But right now I very much doubt it. If Microsoft aren’t using Xamarin, why should I? Microsoft, in a move that many developers were hoping for, purchased the really rather brilliant company Xamarin. Xamarin provides a tool to write cross platform apps from one code base, namely C#. Brilliant! Now the promise of being able to develop for iOS, Android and Windows from the one code base could become a reality without costing a fortune! Microsoft also purchased Wunderlist. This will gradually be retired in favour of their new application, Microsoft ToDo. Microsoft recently released clients for Windows, Windows Phone, iOS and Android. None of which were written in Xamarin apparently. I can’t find any details of which Microsoft first party apps for iOS and Android are written in Xamarin, but I suspect it’s not many. It should be a case that virtually all Apps from Microsoft should be written in Xamarin (with the possible exception of those requiring a significant of low level access, and even then I’m not convinced they couldn’t be coded partially in Xamarin if it’s as good as portrayed). Microsoft used to be the best at eating their own dog food. If they are indeed doing this, isn’t it time we were told? …but it is starting to feel a little slow and underpowered. But that’s clearly not going to happen in the near future, if at all. But then the L950 will let me play with Continuum… and I do love Windows Mobile. I need more money so I can just by both. Not just got the technology, but just as much (if not more so) for the awesome staff. So now the bridges really can go both ways. I’ve been using OneDrive for many years now, starting not long after it’s release as SkyDrive. Back then new users were allocated 25Gb of storage space for free, an incredible amount for the time. In later years this initial free allocation has fallen to 15Gb for new members, although existing users kept their 25Gb quota (this is listed as 15Gb free and 10Gb loyalty bonus in the graphic below). 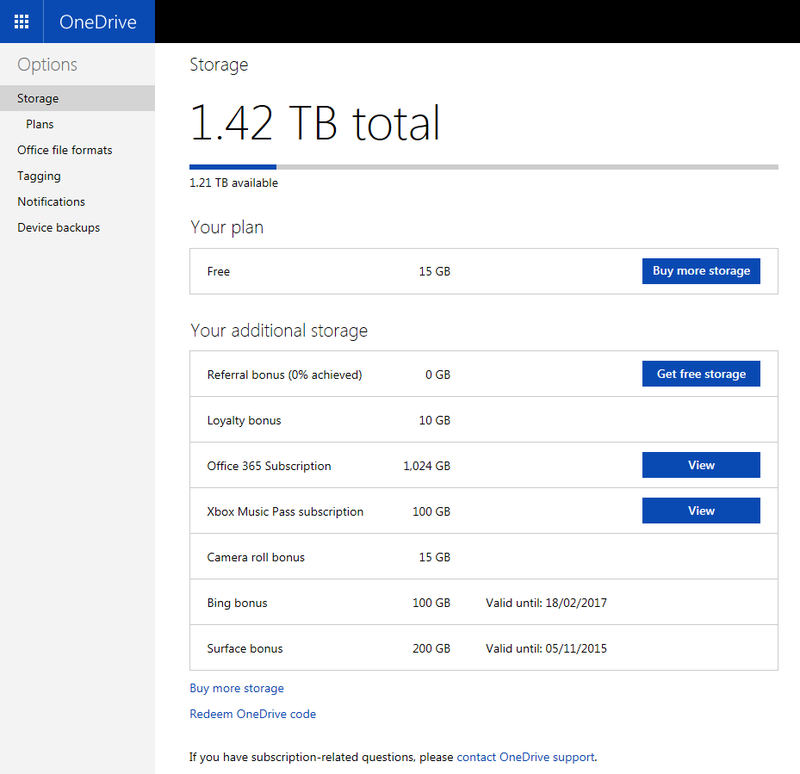 Also over the years I’ve taken up or been assigned various other offers of additional free space, the most notable of which was the 200Gb of free space for two years after I purchased my Surface Pro 2. This has meant that I’ve always had plenty of cloud space to play with, and saw me starting to transition my digital photo backups to the cloud, consisting of many gigabytes of files. Recently I took out an office 365 subscription which now means I have 1 terabyte of cloud space at my disposal. Actually, that’s not true, I have unlimited space but either Microsoft is still rolling this out, or it’s assigned as you come close to needing it, I can’t remember exactly what the situation is but it’s not an issue right now. So how much does all this cost… well an office 365 Home subscription for 5 people officially costs £79.99. So that’s Office on the desktop for 5 people (including all updates, so when patches or the next version are released you are eligible for them), plus that 1Tb/Unlimited OneDrive space for each of the 5 users (alternatively for £59.99 is Office 365 Personal, a single user licence is available). Oh, and there’s 60 minutes of Skype calls to landlines (worldwide I think) per month included too. It’s expensive for some users, but for somebody like me it’s good value. Not that I paid full price, a quick search on eBay can reveal some decent savings, along with the fact that a lot of phones and small screen tablets come with a year of Office 365 Personal thrown in for free, sometimes with devices costing less than the £59.99 of the licence when purchased on its own! So considering I never used more than about 10% of my free allocation, with more than 1Tb of space I now have it was time to start shifting more of my precious files to the cloud. I’ve already mentioned moving my photo archive over. This is a slow process as I’m trying to take the opportunity to make sure the photos are correctly tagged and filed as I go. So what else goes up? Well, I started to copy over the FLAC rips of my music CDs I’ve completed, since this took so much time and it would be nice to have an offsite backup. And now Xbox music allows you to stream MP3 and AAC files stored in the Music folder on OneDrive, so I’m currently copying them over slowly (the flac rips have gone on hold until this process is completed). Unfortunately this archive consists of many gigabytes of data so it is a slow process, especially with the comically bad upload speed I get on my current Virgin cable connection (I can’t upgrade as I’ll be locked in to a new contract for another year and I want to move house soon). I’m trying to alleviate this by performing as many uploads as I can over hotel Wi-Fi, but even so it’s a slow process. Well, my documents are already on there. Personal videos are going up as a by-product of the photos. I don’t think I have the bandwidth to put ripped DVDs and Blu-Ray files in the cloud. So I’m not sure. What I do know is that it’s good knowing I have a backup of my files offsite. Being able to easily stream or view those files is also a fantastic feature. Now then, let’s get that move sorted and get some serious internet upload speed. As expected Microsoft failed to announce a new flagship phone at the recent Mobile World Congress, leaving the Lumia 930 (announced in April 2014) as their flagship device. Apparently they are waiting until the release of Windows 10 before releasing a new phone. Yet at the same time they have released the mid-level Lumia 640 and 640 XL, with the promise that these devices will be upgradable to Windows 10. To me, this makes a nonsense of holding off releasing a flagship now, especially since many who purchased the only reasonable selling Windows Phone flagship device, the Lumia 920, will be up for renewal. The 920 was released a little under 2 ½ years ago, most contracts are 24 months, so this would have been a perfect time for a new flagship. Then there’s the other issue. I’ve been trying to hunt down the other high end Windows Phone, the Lumia 1520, but according to suppliers it has been discontinued. Really? Of your two high end phones you no longer make one of them? I will probably wait until the new models arrive as I want a high end phone on the Windows ecosystem for personal reasons, but I fear I’m the exception. When I started working at my current client I was surprised at the number of Windows Phones in the office. That is visibly changing though as I witness one colleague after another switching to Apple or Android devices, and I can’t say I blame them. All is not lost, yet, but Microsoft definitely seem to be making life harder for themselves, and the loyal users. I’m sure they have their reasons, but it’s almost enough to make me look elsewhere. If I’m honest, if it wasn’t for my desire to be involved writing cross platform Windows 10 applications I would have jumped ship myself by now. Don’t get me wrong, the new 640 and especially the 640 XL look like excellent devices for the price. I’m seriously considering upgrading my partner’s Lumia 920 with the 640 XL as it’s all she, or indeed 90% of the public would require. But it’s not the flagship device many of us are crying out for. I do hope Microsoft get this situation sorted before too many people lose patience, but unfortunately I’m doubtful this will happen.